Denel, an Imperial mage, is a member of the Mages Guild and is currently working under Skaleel on a research project at Vahtacen. In particular, he has been trying to decipher the strange, magical code of a column in the ruin. He is peculiar in that he has absolutely no schedule whatsoever. He will therefore simply stand still close to the column in the final chamber of Vahtacen's first zone. He wears middle-class attire consisting of burgundy linens and shirt and a pair of thick cowhide shoes. His only other possession is a leveled amount of gold. He doesn't wield any weapons, relying instead on a set of leveled mage spells. When you approach him, he will warn you: "Be careful in here." Even though Denel doesn't share Skaleel's frustration on Irlav Jarol, he shares her feelings on their project in Vahtacen: "Sent you in to try your hand at the thing, have they?" He will proceed: "I've had my fill of the place, that's for sure. And I've got the scars to prove it. Once we figured out the pillar reacted to spells, we tried out a few. I think I was only unconscious for an hour or so, but that was enough for me. I'm trying to help Skaleel as best I can, but I'm not going near the thing again." When asked about the pillar he will offer what little information he knows: "I don't know how much Skaleel told you. We know that it reacts to magic, but every time we've tried, the thing shocks whomever cast the spell. It hasn't been fatal for anyone yet, but we stopped trying after the first few attempts. I can tell you, it really hurts. The only thing we haven't figured out is the markings. See them on the walls? They must relate to the pillar, but I don't know how. If we had some sort of reference, something to compare them to, we might be able to decipher them. But we lack anything like that. Skaleel might have a book that would be useful, but she's been sulking over the way Irlav's been treating her. Perhaps you could ask her for it?" When asked about the references he will reiterate: "I don't know. Anything might help these inscriptions in the ruins. They're like nothing we've seen to date." He will hint towards a reference to help unlock the pillar: "I don't know what else to say. Until we have some sort of reference for understanding these symbols, we'll never figure this thing out." Once you have acquired the book, Denel will be quite firm when further asked about the pillar: "You're the one with the book. You tell me how it works!" On the subject of the references he will be quite annoyed with Skaleel: "You've got the book, eh? Good for you. I've given up trying to deal with her for now. I'll tell you what. I'll take the book, and then if you can read me the inscriptions, I'll see if I can find translations for them." He will then remove the text from your inventory. On the subject of references he will be happy to help: "Now that I have the book, we can try and translate what's on the walls here. You just read the inscriptions, and let me know what they say." He will exit conversation expressing his excitement: "This is kind of exciting, don't you think?" In the other end of the ruin, Skaleel will comment on him and his numerous attempts: I've given up trying to figure it out. It's just beyond us. Why Denel stays down there, I have no idea. He's just asking to get killed." And she's pessimistic about the whole affair: "I don't know why Denel is even trying. This is doomed to fail. But fine. If he wants it, he can have it. It's just one more thing I'll get blamed for in the end." 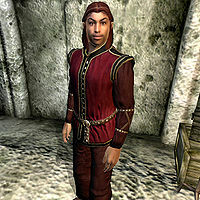 Denel will be key to cracking the code of the column thanks to his extensive knowledge of the Ayleid language. When asked to translate the various tablets he will say: "Okay, what do you need translated?" 'mafre' seems to translate to frost. So a spell with frost damage should work for it. Anything else? According to this, it translates to "From Fire, Life." Fire it is, then. Anything else? It means "Magicka Darkens." Considering the other inscription, it could be translated to mean "Magicka wanes," along with "Magicka waxes." Perhaps a spell that damages Magicka is what you're looking for. or Here we are: "Magicka Darkens." Hmm, that's an odd one. Perhaps it's not a literal translation, then... is there another inscription like it? It means "Magicka Shines." Taken in context with the other inscription about Magicka Darkening, perhaps there's an alternate translation. If we assume it means "Magicka Waxes," then a spell increasing magicka might be what we need. Something that fortifies it, perhaps. or It translates directly to "Magicka Shines." That doesn't seem right. Perhaps it makes more sense in context; you should look at the others. Once you have cracked the puzzle, he will be overjoyed: "Well, would you look at that! Someone will need to see where this goes. I think you should go; you've done all the hard work. after all. If there are any discoveries to be made, you should be the one to make them. You deserve that much." He will advise you: "Be careful, and watch your step." He will express his admiration for you: "I'm really impressed. You made getting past that pillar look easy." Denel appears to have a large amount of unused dialogue, which was supposedly meant to be used in a variation of the related quest which was then discarded.